Some guys always seem to forget to re-spool their ice reels with new line. Maybe they are too excited to hit the ice, maybe they’re just lazy. Either way, don’t be like them. If you left your line on the spool over the summer, the smart thing to do is strip it off and put on some fresh new hotness. But what line should you put on? 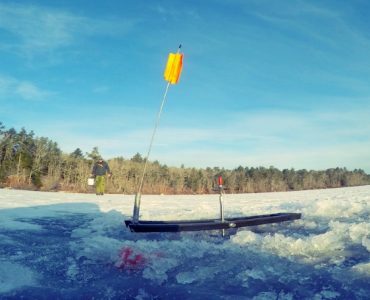 What ice fishing line is best? I know the feeling, looking at the dozens of brands and styles on the tackle store display, wondering what to do. By following a few simple guidelines, it’s easier to narrow down you options. Line choice depends on your target species, water clarity, and ice fishing techniques you’ll be doing. In this guide we’ve sifted through every line on the market to give you our top picks for braid, mono, fluoro, and tip ups. 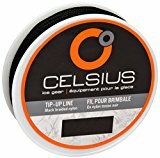 Berkley FireLine Micro Ice – Top rated, best selling ice fishing braid. 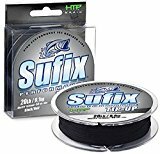 Suffix 832 Ice Braid – Best braid for ice fishing overall, but more expensive. 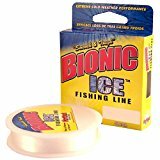 Trilene 100% Fluorocarbon Ice – Top rated fluorocarbon line for ice fishing. 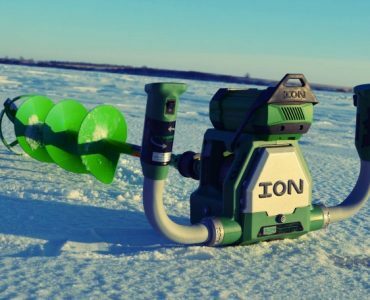 Suffix Ice Magic – Best mono for ice fishing. Cold Temperatures – Freezing temperatures does funny things to fishing line. Think about how your jacket gets stiff in the cold. Fishing line is no different, and that is why manufactures use slightly different formulations for cold water fishing line. 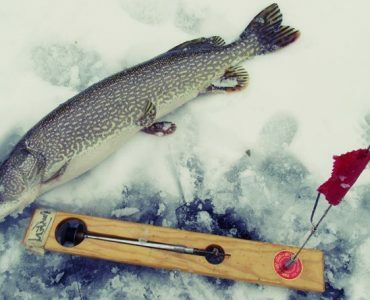 Ice fishing line is easier to handle in the cold than regular line, and is better suited to deal with cold water temps. 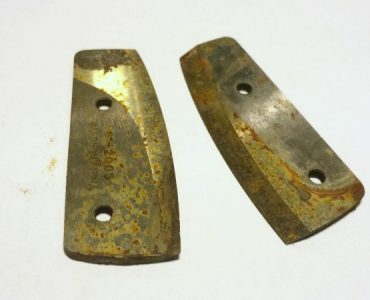 Abrasive Environment – The sharp, jagged edges of an ice hole can make quick work of fishing line. Good ice fishing line has some abrasion resistance to combat the shards of ice. Sand, dirt, and grit are also enemies of fishing line. They tend to collect on the ice as the season progresses, so good clean line is important. Light Bite Sensitivity – Fish are generally less active in the winter, and that can mean subtle, ultra light bites. Mono is fine, but braid and fluorocarbon fishing lines are the most sensitive. Sensitivity is not an issue with tip up line. It just needs to come off the spool smoothly until you can get to the hole and pull up the fish. Stretch vs No Stretch – Line stretch can help or it can hurt, it really depends on how you are fishing. Fluorocarbon has little stretch compared to mono, and it’s very sensitive. When the bite is subtle, fluoro excels. But stretch can help give your jigs and spoons a fluttery action, so it all depends on what you are doing. Braid can be used for deep water jigging since it has no stretch, and it also makes a great main line, in conjunction with a fluoro leader tied to a swivel. Their are four types of ice fishing line; monofilament, fluorocarbon, braid, and tip up line. 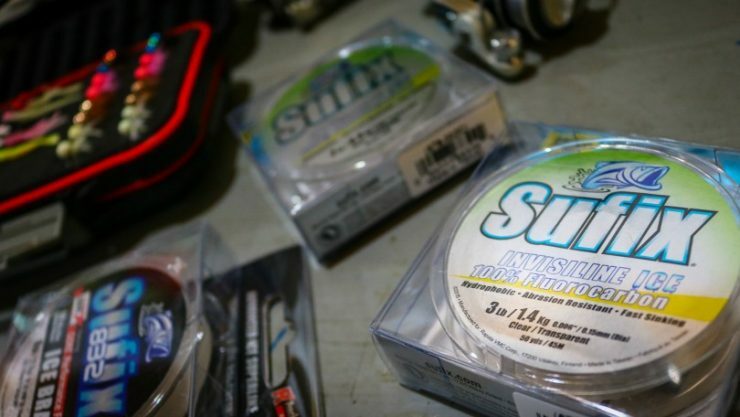 They are just like the fluorocarbon and braid that you use during the summer, but with special formulations to operate better in below freezing temps. These are the top 3 recommendations for each type of line. Mono is the bread and butter ice fishing line. It’s popular for its soft, low memory nature, and gives nice fluttery action to spoons and jigs because it is slightly buoyant in water. The downside is you loose some sensitivity in comparison to fluorocarbon and braid. Being more susceptible to the abrasiveness of ice, sand, and grit, you will be replacing it more frequently. Fluorocarbon is a step up in quality from mono. It’s tougher, more sensitive, and has less stretch. Fluorocarbon sensitivity is excellent, and works well for detecting ultra light bites. Fluoro also sinks four times faster than mono, making it perfect for deeper water, and for quickly dropping a bait when you see a fish on your flasher. Stiffer fluorocarbon line makes driving hooksets easier, but has the drawback of high memory. Fluoro tends to coil up after being on a spool for a while, leading to birds nests and knots if you’re not careful. One trick is to use a cheap mono or braid backer line, and just 10-20 yards of fluorocarbon to keeps things manageable. Braid is an excellent ice fishing line, especially when the water has some stain to it. The main advantages to braid are the ultra small diameters, toughness, and low stretch. You can fish braid that looks like strands of hair but is still 3-4lb test. If you find fish over deep water, braid should get the call, as the no stretch will help get hooks penetrated at depth. One downside to braid is the absorption of water, which obviously can be a problem in single digit temps. some braids have coatings that help reduce the effect. At first glance, tip up line looks like it’s regular braid, but there’s more to it than that. Tip up line is typically made of woven Dacron (nylon) fibers. So yes, it is a type of braid, but it’s unlike a superline in how it performs. Tip up line is much smoother than braid, it doesn’t coil or kink the way a Fireline tends to do. When a fish takes your bait, you want the line to roll off the tip up just as much a s the fish is moving. Braid will uncoil faster putting slack in the line and giving fish the chance to come unhooked. Tip up line doesn’t, allowing a quicker hookset and more fish iced. When fishing for crappie or walleye you can also use a fluorocarbon leader to gain the invisibility advantage.